Kids are always terribly excited when they see a rainbow. And parties, well, we’ve yet to meet a kid who doesn’t go crazy with excitement for those. So, we’ve been wondering, what happens if you put the two together? You get a pot of party gold, that’s what. If you remember the Snow White party we featured earlier this year, you’ll know that Melbourne mum-of-two Simone is nothing short of a creative party genius. 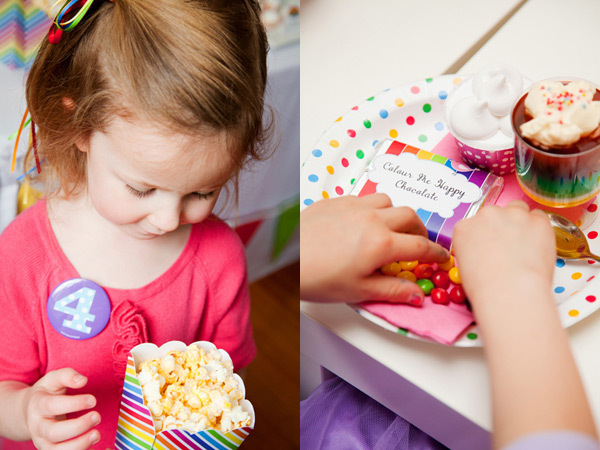 And she’s dazzled us again with the rainbow affair she threw a few weeks ago when daughter Tess turned four. 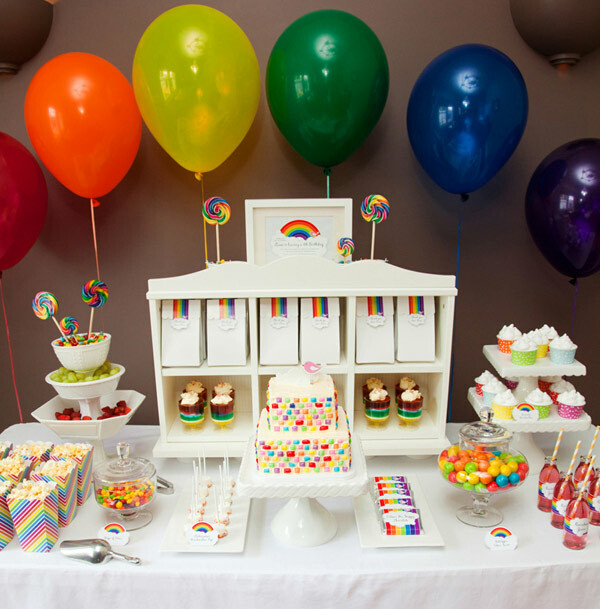 Take a look at the party table – isn’t it a sweet delight? Simone deliberately kept it simple with white tableware and a plain tablecloth to let the treats do the talking. 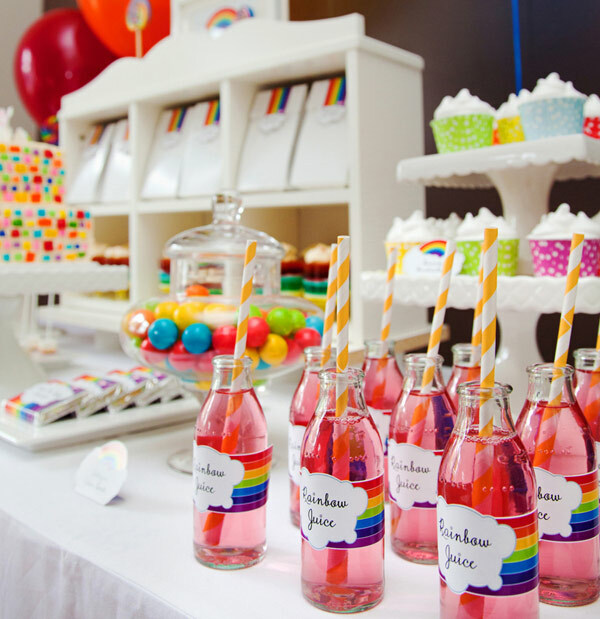 We love the way she used the common-as-muck Ikea Hensvik wall shelf to hold the party treat bags and the rainbow layered jellies. Such a clever idea and framed beautifully with that rainbow of balloons standing at attention behind, each positioned just so. (Though be warned: if you don’t already have one, it appears this pretty shelf is sadly and regretfully discontinued). 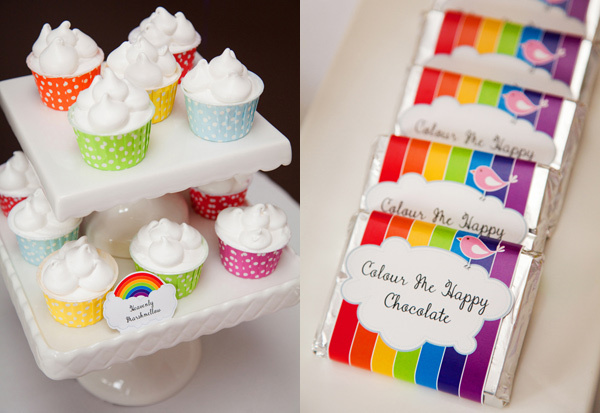 Colourful cloud-topped cupcakes, custom-wrapped chocolates and oodles of lollies contained in pretty candy jars provide more pops of colour on the sweets table, along with layered rainbow jellies, fruits and sprinkle-and-white-chocolate coated marshmallows (below). Now about that cake. Super-impressive, huh? 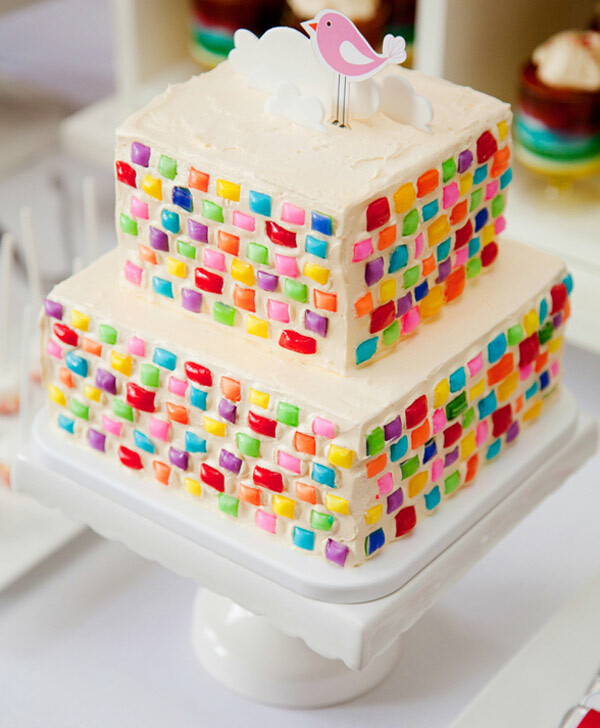 Something very different to the usual rainbow-layered cakes so in vogue right now, this buttercream-topped extravaganza came from cake maker extraordinaire Emma Mackay at Cakes of Our Lives. 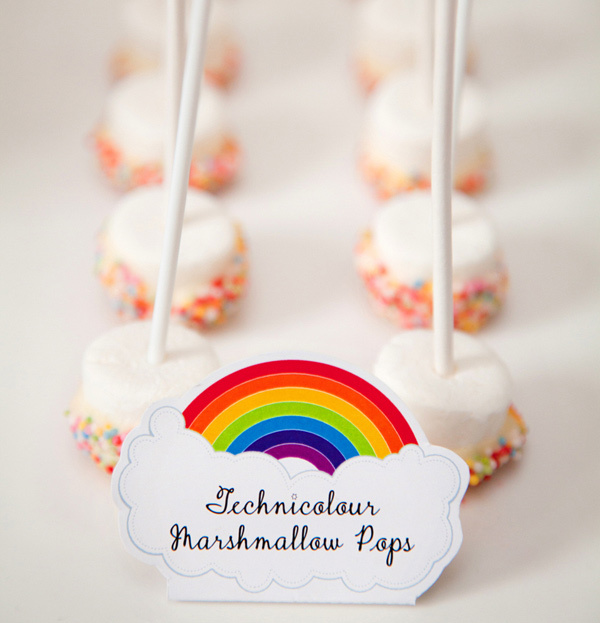 Simone is a graphic artist by profession and designed the cheerful rainbow-themed printables herself. You can see them used to great effect on the “colour me happy” chocolate bars, the glass drink bottles and the take-home treat bags for the lucky little guests filled with lollies and stickers. Here’s a tip – Simone found the foil-wrapped chocolate bars at Aldi, for those who’d like to try something similar. 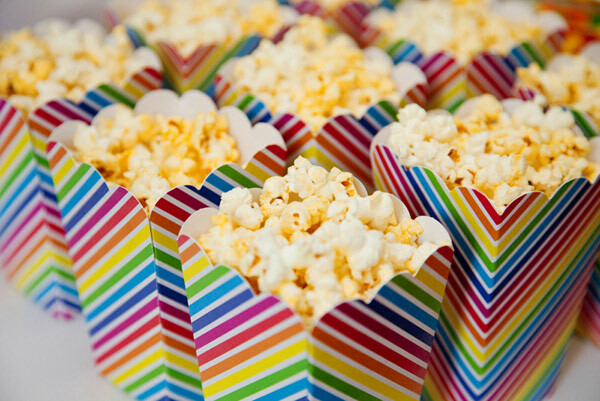 The popcorn boxes, cupcake liners, treat bags, paper straws and much of the tableware (both porcelain and paper) came from Simone’s own online party store, Invite Me – opened only a few months ago after Simone wisely decided to embrace her passion for children’s parties and share her clever finds with the rest of us. We say talent like this deserves to be shared with the world! Now onto the games. Simone tells us the party was meant to be held outside, but dreary wet weather forced the festivities indoors. Happily, the rain stopped and a real-life rainbow appeared (suitably impressing the little guests) just in time for a treasure hunt of gold-wrapped chocolate coins which were cheerfully deposited into a pot at the end of the balloon rainbow on the party table for sharing fairly later.